From small dents and scratches to full body damage repairs and restorations, the collision center here at Spirit Ford can fix it. 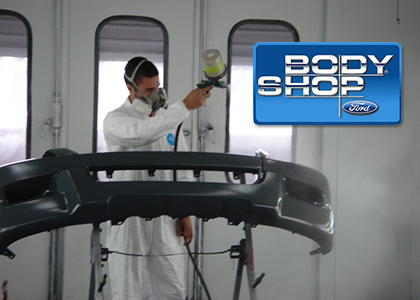 Our body shop team can work on any make or model vehicle to have it looking like new again. Do not trust your collision repairs to just any body shop in the Dundee area; our certified professionals can have it done quickly and accurately. We will work with your insurance company to get your car or truck back on the road as soon as possible. If you were involved in an automobile accident and your vehicle suffered body damage, worry about you and your family and we will worry about your vehicle. We know how stressful an accident can be, that is why our staff will walk you through every step to getting your car or truck back on the road safely. The body shop and collision center here at Spirit Ford explains the process from start to finish, this way you know what is going on at all times. We work hard to get your vehicle back to the manufacturer specifications and ensure it is safe for both you and your family to drive again. As one of the premier body shop and collision centers in Dundee MI, you can be sure your vehicle will be repaired correctly the first time. Our state of the art collision center allows us to do repairs that other body shops cannot perform. Even if they can, our team can still finish these repairs in a far faster and more accurate manner. Do not trust your collision repairs to just any body shop in Dundee; call Spirit Ford and see why so many residents choose us as their preferred body shop and collision center. 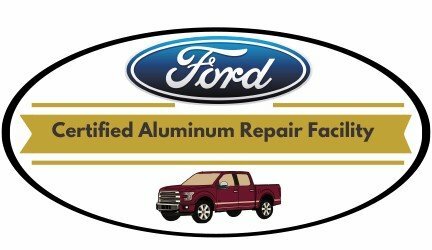 Spirit Ford is Washtenaw, Monroe, and Lenawee counties only Ford Certified Aluminum repair facility. We have the special equipment, facility, and training to handle the complexities of repair on modern aluminum body panels and frames. Learn more by speaking to our Body Shop today.